La Bretagne Divisee en ses neuf Evesches qui font aussi l'estendue des Receptes de la Generalite de Nantes. 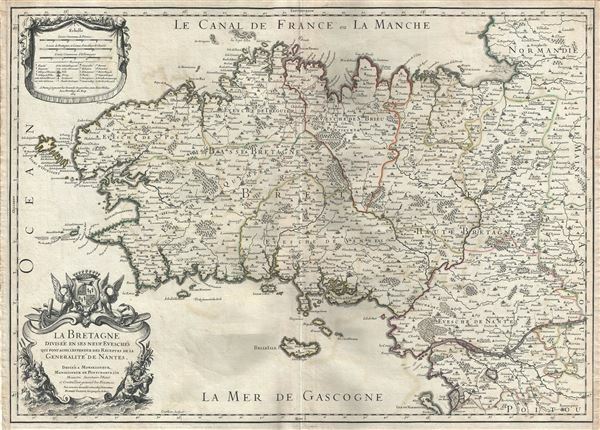 This is a scarce 1706 map of Brittany, France by Alexis-Hubert Jaillot. It covers the former province of Brittany from Granville south to Noirmoutier-en-l'lle and from the Celtic Sea inland as far as Craon. The region includes the departments of Finistere, Cotes-d'Amor, Ille-et-Vilaine, Loire-Atlantique (previously known as Loire-Inferieure) and Morbihan. The map renders the entire region in extraordinary detail offering both topographical and political information with forest and mountains beautifully rendered in profile. The map identifies the island of Ouessant, the north-westernmost part of France. This western region of Brittany (department of Finistere) is known for its cider production and excellent boar hunting. The Ille-et-Vilaine region, in the northeast of Brittany, is famous for its seafood, and especially oysters. The dramatic island and castle of Mont Saint-Michel is depicted just off the coast. The region of Loire-Atlantique, located in the southeast, is part of the Loire Valley wine region, and is especially known for its production of Muscadet, a white wine produced from the Melon de Bourgogne grape variety. This area is also famous for a variety of cow's milk cheese known as Fromage du Cure Nantais. Morbihan is an exceptionally beautiful part of the Breton cost noted for its many islands, many of which are now privately owned by movie stars, politicians, well known musicians and other influential people. Morbihan is named for its most unusual feature, a large inland sea near Vannes, itself called The Morbihan. This region is also the home of the mysterious megalithic ruins at Carnac. A beautifully engraved title cartouche adorns the lower left quadrant. This map was created by Alexis-Hubert Jaillot in 1706 and engraved by Robert Cordier. Very good. Minor wear along original centerfold. Original platemark visible. Minor offsetting and foxing.